The Hulmeville Inn offers patrons a unique drinking and dining experience filled with history. The Hulmeville Inn, located in Hulmeville, PA, offers patrons a unique experience serving a large variety of craft beer in a historic building that boasts its age of over 200 years old. The owner, Jeff Lavin, has updated the space for modern amenities while keeping true to the buildings’ historic roots. Located on Trenton Road, the Hulmeville Inn’s building has stood for over 200 years. It once operated as a stagecoach stop between Trenton, NJ, and Philadelphia for those traveling the distance. Hence the roads name, Trenton Road. The tax records for the building go all the way back to 1790 and since then the building has housed multiple different types of businesses. The Hulmeville Inn has been pouring beers and serving pub food since 1997. The bar now boasts 20 rotating beers on tap. Within a year, the bar goes through about 550 unique kegs. 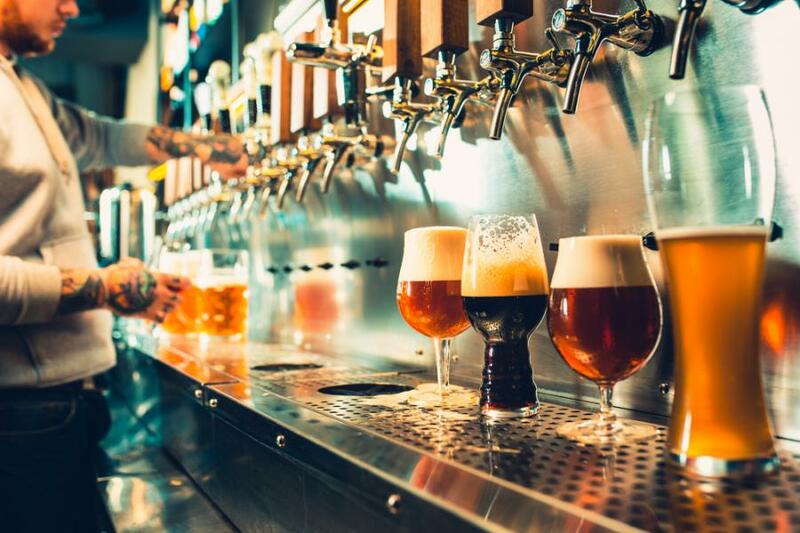 The list of available beers is expansive, so be prepared for tough decision making. The Hulmeville Inn hosts weekly beer events on site and is the official location of the ALEiens Homebrew Club. You can stop by Monday through Friday for happy hour from 4-6 pm for specials on beer and even pub snacks. Not only are they pouring great craft beer, but The Hulmeville Inn is serving up some savory pub food that will not disappoint. From stromboli quesadillas to cheesesteak eggrolls, the kitchen is constantly dishing out new foods that are sure to please. The Hulmeville Inn is not only a great neighborhood spot for Bucks County locals to gather, but it’s also become a weekend attraction for young people looking for a fun night out. The bar is equipped with multiple TVs, pool tables, arcade games, and coming soon, an outdoor beer garden. You can often find Lavin at the bar chatting with patrons and enjoying some of their craft beer. It’s clear upon entering the space and engaging with Lavin that the bar is his pride and joy and a true labor of love. To check out the expansive beer list and upcoming events, visit the Hulmeville Inn website for more information. Or stop by the Hulmeville Inn to experience the historic ambiance yourself!